Superman Barack Obama - Barack Obama.net! There has been much talk about Barack Obama having some type of super powers; I mean, this guy is too amazing to be just an ordinary mortal. 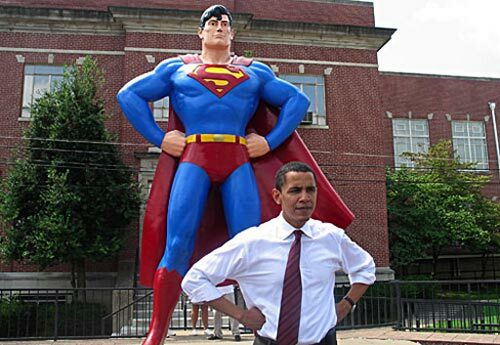 And, not surprisingly, there have been some rumors floating around that Barack is, well…SUPERMAN. Barck Obama - The REAL Superman! So now the story is out – the real Superman is indeed Barack Obama. You see, not only is Barack faster than a speeding bullet, more powerful than a locomotive, and able to leap tall buildings in a single bound, but he can also play a pretty mean game of basketball, write best-selling novels, give inspiring speeches, bring over two decades of deep experience to the presidency, bring hope back to America, bring about change that we can believe in, and, once in a while, go on The Ellen Show and do a little boogie. Now, if that doen’t make him Superman, I don’t know what would!